A group of chemists from the Universidad Complutense de Madrid lead by Prof. Nazario Martín and from the University of Southampton lead by Prof. Richard J. Whitby together with the IQCC members Sílvia Osuna, Miquel Solà, and Marc Garcia-Borràs (ex-member of the IQCC, now in UCLA) have reported the first chemical modification on the endohedral HF@C60. 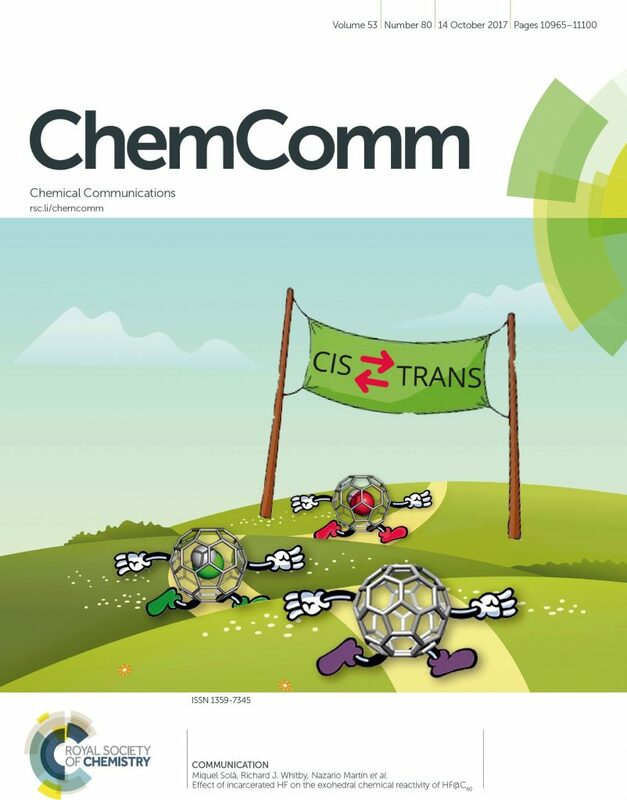 In particular, they have studied the isomerization from optically pure (2S,5S)-cis-pyrrolidinofullerene to (2S,5R)-trans-pyrrolidinofullerene and they have compared it with that occurring in empty C60 and endohedral H2O@C60. Interestingly, they have found that the incarcerated HF molecule contributes to increase the isomerization rate through a H-bonding assistance involving weak hydrogen bonding without affecting the final cis-trans ratio or promoting the loss of enantioselective control through the retro-cycloaddition reaction. The comparative study shows a kinetic order for the isomerization process of H2O@C60 ? HF@C60 ? C60, thus confirming the effect of the incarcerated species on the zwitterionic intermediate stability. The paper was published in Chemical Communications (DOI: 10.1039/C7CC05987F), featuring this week’s Cover of the journal!